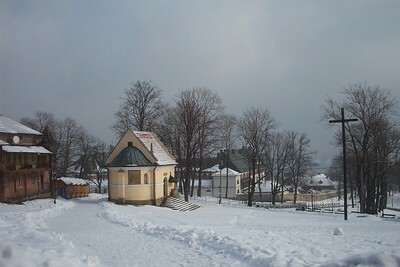 Kalwaria Zebrzydowska is a landscape park and a pilgrimage site. The layout was designed by Feliks Zebrowski in 1604. It intended to represent the landscape of Jerusalem at the time of Christ. It's an example of a so-called Calvary (a man-made landscape symbolizing the stages that led up to Christ's crucifixion), of which many were built in Europe in the 17th century. The site includes a total of 44 buildings, among them many diverse chapels. It was named after its founder, Mikolaj Zebrzydowski, at the time governor of Krakow. The distances between the chapels here are longer than in Jerusalem itself, but within the same proportions. Hourly buses connect Cracow in about 50 minutes with the town of Kalwaria Zebrzydowska. Of course I took the wrong way from the local bus station at first, until I sensed that this road wouldn't take me anywhere else than the bleak outskirts of town. The correct way turned out to be a half an hour uphill walk. 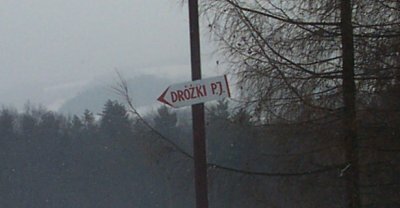 There are subtle marks to guide you though (signs to Kloiszter), and to make it even easier the large Benedictine monastery can be seen from almost everywhere in town. 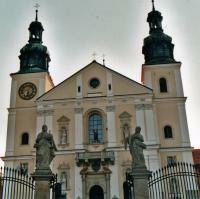 This Benedictine monastery and its adjacent church are the major landmarks of the area. The church, where frequent services are held, is rather loud on colours and gold on the inside. I arrived just after a service had finished, and could still smell the strong odour of incense. Worth seeing also are the traditional wooden houses on the right of the church. I had planned to walk along the Stations of the Cross on this Polish Via Dolorosa. There are three separate tracks however, none of them too visible under some 30 cm of snow. Without clear directions I just roamed around a bit. In all, I was a little disappointed with my visit. I had expected Kalwaria to be more of an active pilgrimage site. Probably I just arrived in the wrong season. As of August 2018, there are many minibuses departing Kraków bus station around every 10 minutes to get to Kalwaria Zebrzydowska in 45 minutes. The bus station in Kalwaria Zebrzydowska is around a 15 minute walk up a fairly steep hill to the basilica. I found it to be lively but not overly busy. I particularly enjoyed the walk around the other small chapels. From the basilica, it is mostly downhill apart from a couple of steep sections near to the basilica. There are two possible trails, but they follow an almost identical route and with a reasonable map (I highly recommend the offline mapping app maps.me) it is possible to visit all of the monuments without much backtracking at all. The trails are, for the most part, wide grassy paths or unmade roads. The whole visit took me just over 2 hours. Read more from Tevity here. A wonderful place to reconnect with your spirituality... This beautiful sanctuary stands a few kilometers from Krakow and close to the birthplace of Saint John Paul II. The atmosphere that surrounds it creates a mysterious mood that is worth trying; I was there with my family in August and 19 August we had an unforgettable experience, taking part in the parade, which takes place (an almost 8 kms walk) for the veneration of Mary, and which was attended by hundreds of thousands of faithful. Besides the shrine, you absolutely must not miss visiting the various chapels dotted around the hillside surrounding the shrine. 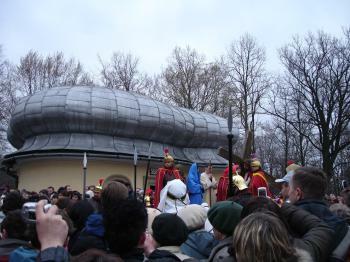 I visited Kalwaria on Thursday and Friday of the Easter week in 2007 and followed Jesus for 10 hours over the two days. I was told that this was the largest annual Passion Play in Europe, with estimated 60,000 people following him. I assume most people were Polish and guarantee that I was the only Asian. It took 10 hours because at each of some 40 chapels some monks spoke in Polish, which I don't understand. I was trying to figure out what drives people to Christianity, but after 10 hours I was a devout Christian! As I talked about visiting this WHS, I expected that my Polish friends would kindly reject my suggestion and that I would have to drive alone from Krakow to Kalwaria Zebrzydowska. But on the contrary, they liked my idea and they even convinced me to go there on a highly frequented day. So six people, none of us very religious, set off for a pilgrimage on a Saturday in August, one day after Assumption Day. When we arrived at the Calvary at 10.30 am, the car park was already half full. There were a lot of stalls along the way to the Basilica selling devotional objects and pictures of the Pope (the Polish Pope of course), but also books, toys and the omnipresent Oscypek cheese. We first went to the Basilica of Our Lady of the Angels and the adjacent monastery, we arrived just between two services, nevertheless the church was full of worshippers and pilgrims. This is definitely a site where normal tourists and WHS enthusiasts are in the minority. The Basilica is not really outstanding, the interior is a bit too colourful for my taste, too much gold and many painted angels. But the forecourt with the surrounding buildings is quite pretty, except for the kitschy Pope statue (again the Polish Pope of course). Much more interesting are the chapels, more than 40 of them are spread over the hilly countryside. The buildings have different shapes, designs and ground plans, one is even heart-shaped, their sizes range from tiny chapels to a two-storey church. The photo shows one of the larger chapels, Pilate's Town Hall and the Sacred Stairs. You can choose between two pilgrim paths, which more or less follow the same route, but in opposite directions. One is dedicated to the Passion of Christ and the other to the life of the Virgin Mary. Rather by chance we took the red-marked path that represents the Passion of Christ. There were a lot of people on the route, individual pilgrims and also small and large groups. The largest group we met were about 200 people walking behind a brass band, they did not sound very spiritual, but rather cheerful like at a festival. At the Church of the Sepulchre of the Blessed Mary, we witnessed how a statue of the Virgin Mary was adorned and prepared for the procession, we were able to take a close look from the upper gallery. We enjoyed our hike through the beautiful landscape, the variety of buildings and monuments, and our rich picnic at the end of our "pilgrimage". I would not add the Kalwaria Zebrzydowska to a list of my top WHS, this kind of Mannerism-Baroque artwork and decoration is not my favourite style. But I liked very much the festive and cheerful atmosphere. If I may borrow the scoring system of one of the most frequent reviewers on this website, I would say: [Site 3: Experience 7]. I visited this WHS in September 2014. Being close to the WHS hotspot of Krakow and only 14km away from Pope John Paul's birthplace (Wadowice), I decided to visit this site by car on a half day trip. Before parking next to the Benedictine Monastery, I stopped to visit the several chapels clustered in what is called "Gethsemane and The Mount of Olives", "The Mount of Moriah" and "The Mount of Zion". The natural landscape and the chapels symbolically represent Jerusalem and the Passion of Christ. Next I visited the Chapel of St. Raphael which is situated right in front of the Basilica of Our Lady of the Angels. The entrance to the Basilica and all the chapels is free and photography is allowed as long as you don't disturb the pilgrims. Around the Basilica, there are numerous confessionals for pilgrims. I've never seen so many confessionals next to each other and I've visited quite a lot of churches and monasteries! After spotting the UNESCO WHS plaque, I hiked uphill on "The Golgotha" to take in the view over the Basilica and to visit the remaining chapels, each with a unique architectural style. The Church of the Crucifixion and the Church of the Third Fall are the ones which stood out. There were several pilgrim groups going up and down "The Golgotha" and following one of the 2 Kalwaria pathways: The Pathway of Our Lord Jesus or The Pathway of Our Lady. 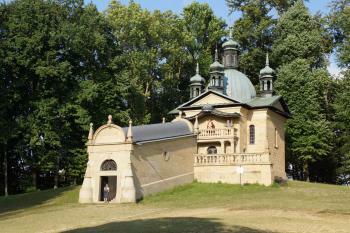 The shrine of Kalwaria Zebrzydowska is one of the most often visited pilgrimage sites in Poland. However, due to the several chapels present as well as the sheer length of both pathways, it wasn't as crowded as other shrines I've visited. The busiest periods are Lent (before Easter) and Assumption Day (15th August). It's worth visiting if you have time as it's an interesting national heritage but to me it doesn't have the OUV to consider it as WHS. This is one of Poland's most famous and important religious sites, second only to Czestochowa and its Black Madonna (a very crowded place, by the way...). It is reasonably easy to reach by minibus from Krakow (the bus stops in the town centre, then you have walk up the mountain for around 30 minutes). The church complex is nice, but nothing really outstanding. The unique feature of the site is the Way of the Cross with its many small churches and chapels scattered in the forest around and above the main church. I only went to a few of them, but they probably give a better understanding of the meaning of this calvary for the Polish religious tradition. Some 40 km south of Krakow, by the foot of the mountains, lies Kalwaria Zebrydowska. It is Polands second most important pilgrimage centre in the Catholic Church and was commissioned for the Bernadine Order in 1600. Today its famous for its Eastern Passion Plays and if you are around here at that time it is said to be absolutely swamped with people. At my own visit it was less crowded but sales of Catholic merchandise was still high in the monastery shop. The surrounding hilly landscape was found to resemble Jerusalem and a plan to build 24 small chapels was laid out in the early 17th century. Today you can take a six-kilometre walk on th hills and visit all the small chapels, built in honour of the Saviour. If I felt less religious or if it was the intense heat on this warm summer day of my visit, I will never know but my visit to Kalwaria Zebrydowska was limited to the beautiful main church and its adjacent monastery. Its not a must-see Heritage Site but if you have a day to spare it's a nice excursion away from the tourist crowds in Krakow. In our trip to Poland we have been to Kalwaria Zebrzydowska, situated between two river valleys (Skawa and Raba) and two mountains (¯ar and Lochoroñska), where are situated also the ruins of two medieval castles, in a forest zone. There is a Mannerist pilgrimage park, founded by the family of Zebrzydowski, and projected by the italian Jesuit Gian Maria Bernardoni, with buildings disposed in the natural landscape. There you can find Italian Renaissance and French Baroque park design with Mannerist freedom and irregularity and a lot of beautiful views and panoramas. Around the ellipse layout of the park are the main buildings and roads that symbolize the buildings and streets of the Passion in Jerusalem, that were used by pilgrims. In the forest or at the end of long avenues are 42 big decorated chapels with a high degree of originality of forms, compositions, details and symbolic purposes: of the Hearth of the Virgin Mary (hearth-shaped plan), House of Caiphas (ellipse), House of Annas (triangle), House of Our Lady (triangle linked with semi-circles), House of Pilate (Greek cross), Holy Sepulchre (rectangle with semi-circular apses), of the Ascension (octagon containing a square), of the Last Supper (elongated rectangle), East Gate of Jerusalem (square with corner pilasters), Palace of Herod… Various techniques, colours and materials were used: unrendered stone and brick, dressed stone and rendered and plastered brick; the roofs are made of copper or zinc sheets or ceramic tiles; the way in which details are applied derives from The Netherlands. Dados and entablatures are used for horizontal divisions and half-columns or pilasters for vertical divisions. Elements of Tuscan, Ionic and Composite orders are used with rusticated faces and surrounds to doors and circular or oval windows; there are also strapwork ornaments, blind arches, corn or acorn pendants, domes with stucco decorations and pulpits in stone and brick on the facades. The interiors have original furniture, decorations and blocks with the inscription "Terra Santa", that contain soil from Jerusalem. Between them there are two large churches. The first is the Baroque church of the Grave of the Virgin, constructed on two levels (one representing the Grave and the other the Ascension), that is in broken stone blocks and has a saddleback roof with a central spire, a strong podium and a rectangular plan with an apse and and entrance porch; inside there is a beautiful sarcophagus made by Paulus Bandarth. The church of the Crucifixion has an elongated rectangular plan with a bipartite interior with compound vaulting and a saddleback roof with a spire. The tripartite facade has three entrances and four projections; double Tuscan pilasters support an entablature decorated with symbolic subjects; inside there are beautiful paintings by Franciszek Lekszycki. In the park, along the avenues, are also many detached resdentia houses: some of them are wooden single-storeyed buildings, with an attic, verandahs and saddleback roofs in many materials. The church of Our Lady of the Angels and the Bernardine Monastery are situated on a mountain and are Baroque masterpieces. The church has a high two-storeyed front with two towers, with Baroque roofs, separeted by a pediment. The interior has an unaisled nave with an elongated choir, three separate chapels with domed roofs, original furniture, altars, choir stalls, statues and a nice pulpit. The monastery has two internal cloisters and a three-storey facade with five projections and lunettes. I liked very much the site because of the quality and variety of the architecture. It's worth to be visited if you are in the Little Poland (if you want to visit all the 42 chapel you must walk for 7 km) and justifies the inscription. The place is about 40 km away from Cracow an is well visible from the way to Bielsko-Biala. There is an early baroque cloister with a big church, which is full of pilgrims. The most interesting is a hill over the church.There is a grove with about 40 chapels, showing the crucifiction and the resurrection of Jesus Christ. The hill is not much crowded, as there is a lot of space for the pilgrims groups. The chapels are build in different styles so the walk among them is quiet interesting. 137 Community Members have visited.